This fall, the District enjoyed hosting the 4th, 5th, and 6th graders from the Elementary School. During a classroom visit, we taught about the importance of wastewater treatment to the community. About 110 kids came out to the plant for a tour of the Laboratory, the Heavy Equipment, and the Treatment Plant. The students had a blast and were asked to submit artwork for inclusion in the District’s 2016 calendar, themed “Water is Life”. 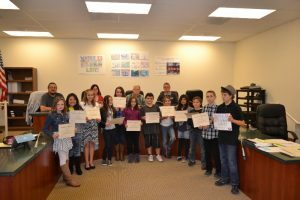 Our Board of Directors recognized the students for outstanding achievement and presented certificates to each of thirteen contest winners. The District received sponsorships to offset the cost of this education effort and we hope to make this a yearly event. A big thank-you to Mrs. Crothers and all the Teachers at San Andreas Elementary School. The District has been awarded grant money to conduct extensive planning for our sewer system, treatment plant, final disposal system, and funding mechanism. These planning efforts are led by our engineering firms, Stantec Consulting and KSN (Kjeldsen, Sinnock, and Neudeck). We are fortunate to have won approval of 100% funding for this engineering work and expect to review their findings in early 2016. Reliable and efficient operation of the plant and sewer system is required to ensure continuous compliance with our treatment requirements listed in the District’s NPDES permit issued by the Regional Water Quality Control Board. The Regional Board has authority to levy fines whenever there are violations of the permit and can also impose more stringent requirements if there is a pattern of non-compliance. So, the ongoing work by Operators is important to minimize potential for violations from occurring. Our treatment plant was established in the early 1950’s and has gone thru several major improvements since, with the most recent upgrades completed in 2009. Some of our infrastructure is really old, dating back to the time of original construction. Our Operators have learned innovative ways to keep the old part of the plant running, but some assets are well beyond their useful life cycle. For instance, the electrical panels and motor controllers for our sprayfield pumping system is on its last leg. Our field staff are trained to get the most out of each piece of equipment and are always looking for ways to extend the life of the District’s assets. Operators perform routine preventive maintenance to exercise and lubricate pumps and valves; and implement predictive maintenance, such as infrared testing of electrical panels to detect arcs caused by loose wiring that can lead to catastrophic failures. When corrective maintenance is required, staff look for the most cost-effective solutions so we can save money. We know that protecting our vital assets will lead to a lower cost of ownership and, hopefully, postpone the need to spend money on replacements. Investing in preventive maintenance is usually much cheaper than reacting to sudden failures of equipment. From all of us at the Sanitary District, we want to wish you an awesome 2016. Happy New Year!